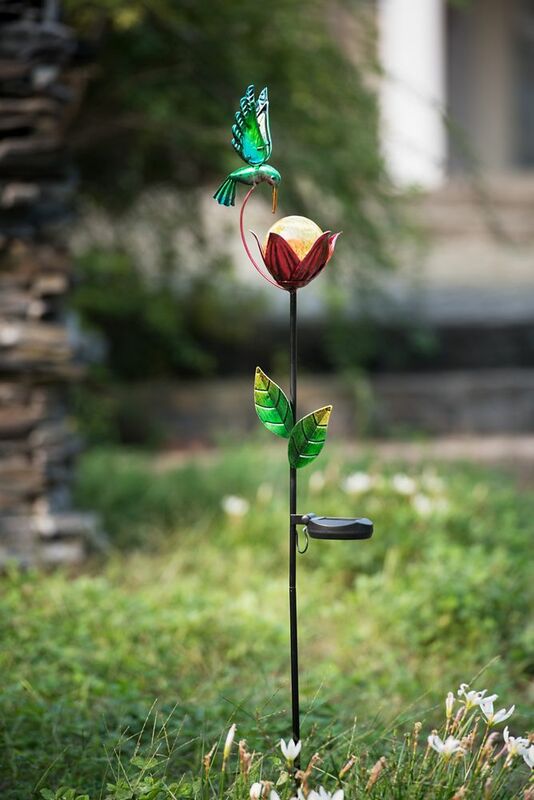 Make your garden a more enchanting locale with the Sunjoy Hummingbird Solar Garden Stake. This ethereal garden stake not only adds a fanciful touch to your patio, garden or path, it provides energy saving outdoor lighting. Featuring a blue and green hummingbird painted in stunning detail and suspended in flight above a crimson and gold flower, this stake stands 43 inches tall. Gathering energy from the sun during the day, an auto sensor prompts the LED light to glimmer continuously during the evening hours. The stake itself is made from sturdy iron and displays two green and yellow tipped leaves as well as a three prong base for easy placement in the ground. The solar panel requires no set up. Simply place the hummingbird garden stake in a location that receives sunlight and enjoy the benefits. This ethereal garden stake not only adds a fanciful touch to your patio, garden or path, it provides energy saving outdoor lighting. Featuring a blue and green hummingbird painted in stunning detail and suspended in flight above a crimson and gold flower, this stake stands 43 inches tall. Gathering energy from the sun during the day, an auto sensor prompts the LED light to glimmer continuously during the evening hours. Enjoy the full bloom and solar glow of a gorgeous purple Hydrangea Garden Stake day and night, all year long! Each individual blossom is crafted from glass and the entire flower is situated on a realistic stem with graceful leaves. This beautiful stake will illuminate at dusk for hours of glowing enjoyment! Welcome to the majestic world of Fairy Gardens. This miniature patio furniture set is the perfect place to start building your miniature garden landscape. These tiny scenes come to life with a little soil, some greenery and a little imagination. 6-piece kit Includes: 2 chairs, 1 table, 1 bench, 1 planter, 1 bicycle planter, 1 gazebo. This pastel Sunjoy Glass Bird Feeder Garden Stake serves multiple purposes, providing a touch of beauty to your garden or patio and also drawing wildlife to your yard for a snack or a bath. The pink glass garden stake features two iridescent hand painted glass plates. The bottom tray, painted in a shimmering yellow, functions as either a bird feeder or bath, and the top, painted in pink, is an additional feeder. Simply add jelly, a nectar-soaked sponge or pieces of overripe fruit and enjoy the songbirds that come to visit. This ornate stake is adorned with pink and yellow glass orbs affixed to the sturdy iron rod, giving this delicate piece of art a delicate springtime appeal. By flushing the tray with water, the bird feeder is incredibly easy to clean. Do not put in a dishwasher. The stake itself features a three prong base for easy placement in the ground. Flower Garden Garden Stake With Solar LED, 35 Inch, Set Of 2 Make your garden a more enchanting locale with the Sunjoy Hummingbird Solar Garden Stake. This ethereal garden stake not only adds a fanciful touch to your patio, garden or path, it provides energy saving outdoor lighting. Featuring a blue and green hummingbird painted in stunning detail and suspended in flight above a crimson and gold flower, this stake stands 43 inches tall. Gathering energy from the sun during the day, an auto sensor prompts the LED light to glimmer continuously during the evening hours. The stake itself is made from sturdy iron and displays two green and yellow tipped leaves as well as a three prong base for easy placement in the ground. The solar panel requires no set up. Simply place the hummingbird garden stake in a location that receives sunlight and enjoy the benefits. Flower Garden Garden Stake With Solar LED, 35 Inch, Set Of 2 is rated 3.0 out of 5 by 1.